As part of all real estate sales contracts, each state should require the disclosure of known transmission pipeline easements on the property. The intent is to provide potential land purchasers with information about the rights and restrictions of a transmission pipeline easement prior to purchase of the property. 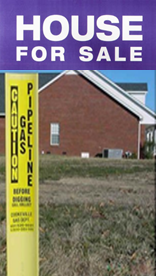 California Bill Number AB 1511 – Every contract for the sale of residential real property shall contain a notice that information about the general location of gas and hazardous liquid transmission pipelines is available to the public via the National Pipeline Mapping System (NPMS). Arizona state law requires that subdivision developers have a disclosure document, called a Public Report, on file with their office in order to have permission to sell subdivision lots. The Public Report must be given to new home buyers prior to the purchase so that they may make an informed decision. Disclosure of hazardous liquid and natural gas pipelines must be made when the pipelines are located within 500 feet of the subdivision boundary.